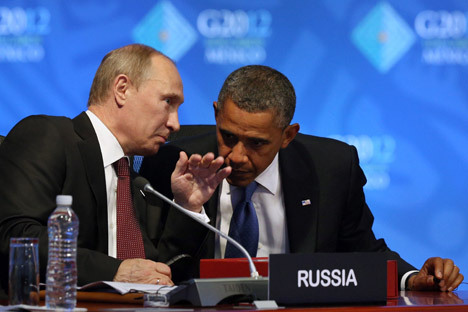 Barack Obama and Vladimir Putin have had their first meeting since Putin’s reelection the G20 summit. The statement issued after their talks indicates their joint desire to show cooperation rather than conflict. On the sidelines of the G20 summit in Los Cabos, Mexico, U.S. President Barack Obama and Russian President Vladimir Putin had their first meeting since Putin returned to the Kremlin last month. The word “reset,” which has described bilateral relations between the U.S. and Russia in recent years, is not in the final text of the joint statement, but the document indicates that the two leaders want to show their commitment to developing bilateral relations and working together on key global problems. Will the Magnitsky blacklist sour U.S.-Russian relations? The six-page joint statement reflects the priorities in American-Russian relations. According to the document, the top priority is economic cooperation. “We have agreed to prioritize the expansion and diversification of our bilateral trade and investment through nondiscriminatory access to our markets based on international rules,” the statement reads in part. In his February op-ed in the Russian daily Moskovskiye Novosti devoted to Russia’s foreign policy, Putin stressed that U.S.-Russian relations lacked the “safety net” usually provided by trade and economic ties, and the U.S. president has repeatedly stated that he would like to see America’s exports double in 2014 to help tackle unemployment. After Russia’s accession to the WTO, its market will become very attractive for American businesses, although the U.S. cannot grant Russia most favored nation status without a repeal of the Jackson-Vanik amendment. Recent reports from Washington indicate that the Obama Administration is working in that direction, but the same reports note that the U.S. Congress intends to replace the amendment with the Magnitsky Bill, which has no direct bearing on trade but again shows Moscow that Washington does not consider it a full partner. According to Putin’s aide Yury Ushakov, the topic was to be discussed by the two presidents, but it is not specifically mentioned in the text of the joint statement. According to the statement, the second priority in U.S.-Russian relations is interaction on nuclear arms control and non-proliferation. “We reiterate our strong support for the Treaty on the Non-Proliferation of Nuclear Weapons,” reads the statement. The problems of disarmament are treated in this context, albeit in very careful language. Russia and the U.S. intend to continue their dialogue on strategic stability; the American push for continued arms cuts, while not rejected, have not moved into the stage of concrete discussions. The most sensitive issue in bilateral relations – deployment of U.S. missile defense systems in Europe – is also described in very diplomatic terms. The statement says: “Despite differences in assessments, we have agreed to continue a joint search for solutions to challenges in the field of missile defense.” The tone is neutral and there is no hint that building the system might provoke a new arms race. The statement addresses Iran and North Korea in the context of mutual adherence to the non-proliferation treaty: “The pursuit of international peace and security remains a priority for the United States and Russia, recognizing how much we have to gain by working together to overcome the main challenges of this century.” The statement underscores the president’s common view of the key role of UN mechanisms in this process, in contrast to the unilateral U.S. foreign policy pursued during the Bush Administration. According to the statement, Washington and Moscow are ready “to cooperate bilaterally and multilaterally to solve regional conflicts,” especially in Syria, and also on the basis of UN mechanisms, notably by supporting the mission of UN Special Envoy Kofi Annan. The words “joint,” “cooperation” and “together” occur about 20 times in the statement; The document opens and ends with these words. Of course, with the U.S. election looming, the Obama Administration is reluctant to give prominence to problems in relations with Moscow. On the other hand, the Russian president, who assumed office a little over a month ago, would like to make clear the Kremlin’s fundamental approach to relations with the U.S. “From my perspective, we have found much commonality on all these issues,” Vladimir Putin said after the talks.